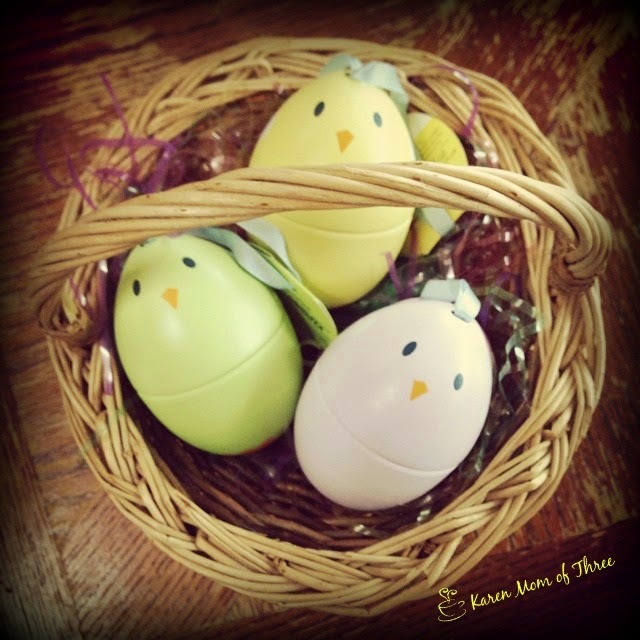 Davids Tea Easter Eggs Filled With Tea! Delightful! Last Thursday night I picked up the most adorable trio of tea tins from David's Tea. I live very close to two stores and used a gift card I was given from a very thoughtful friend to bring these Easter Beauties home for my tea table. The tree flavors inside these tins are just under an ounce of Chocolate Macarron (a favorite black tea of mine), Forever Nuts a Herbal tea and Read My Lips (also a lovely black tea) These teas are amazing on their own and you can combine them to make some truly wonderful blends! You can order on line at Davids Tea by clicking here or pop out to your local Davids tea and see if they have some left! 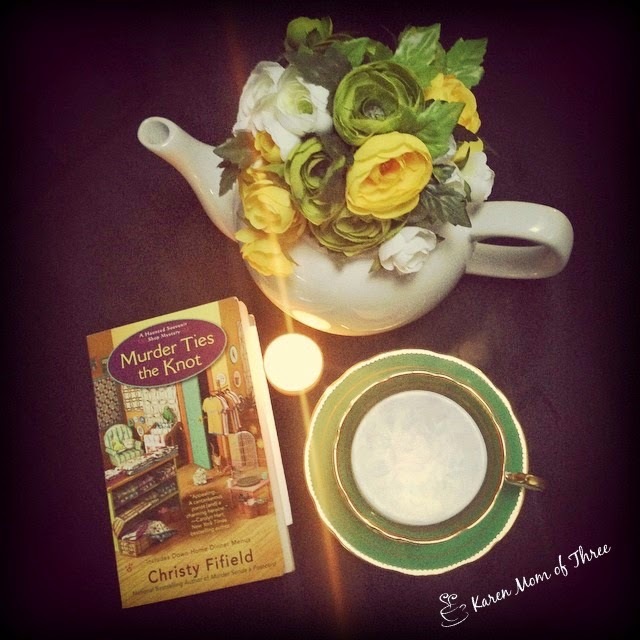 I loved this set and I know the tea lover in your life will too! Click here to see the listing on Davids Tea Website. I found this to be a light an fun cozy with enough paranormal antics to keep you entertained and intrigued. The mix of characters and personalities round out the story and give it great depth. As the title dictates the series has paranormal cozy flair and it doesn't disappoint. 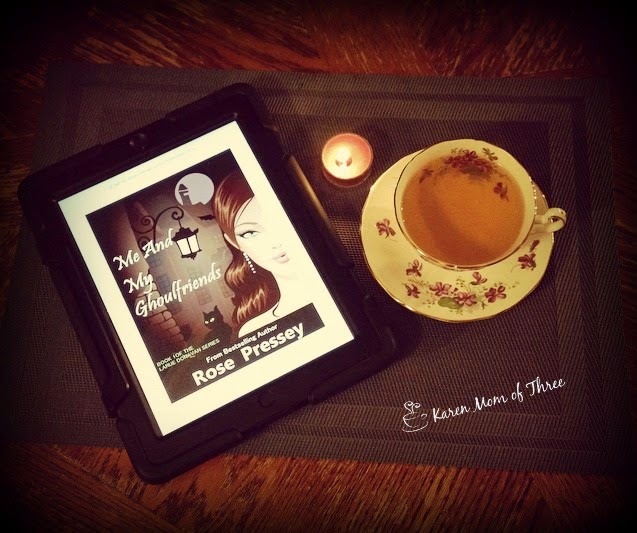 I enjoyed this story and if you are a little like me and enjoy a cozy complete with witches and ghosts this is a series you may want to add to your to be read list. 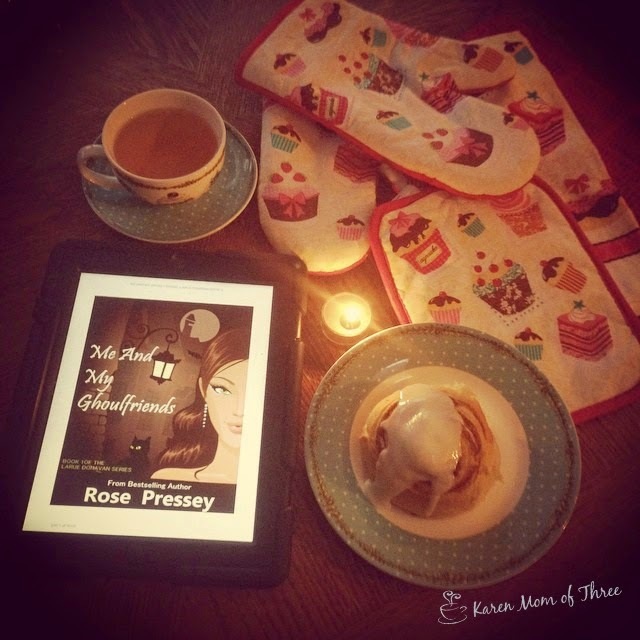 Click here to learn more about Rose Pressey and this fun cozy series. In my tea pot and keeping me sane this week was an Earl Grey Cream Tea + Lavender that I had the tea blender at Blue Teapot at the Lonsdale Quay blend for me. 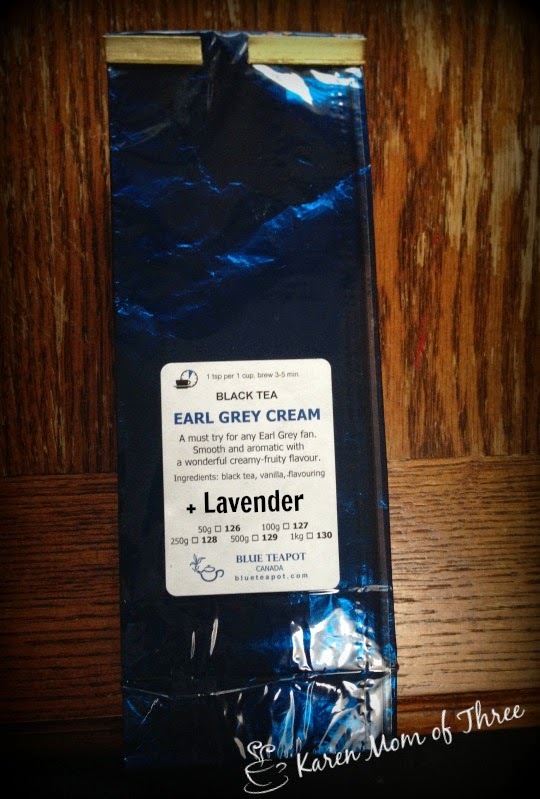 I asked for 100 grms Earl Grey Cream and had her add 50 grms of Lavender to my tea. This is a very calming blend and I have enjoyed it so very much. 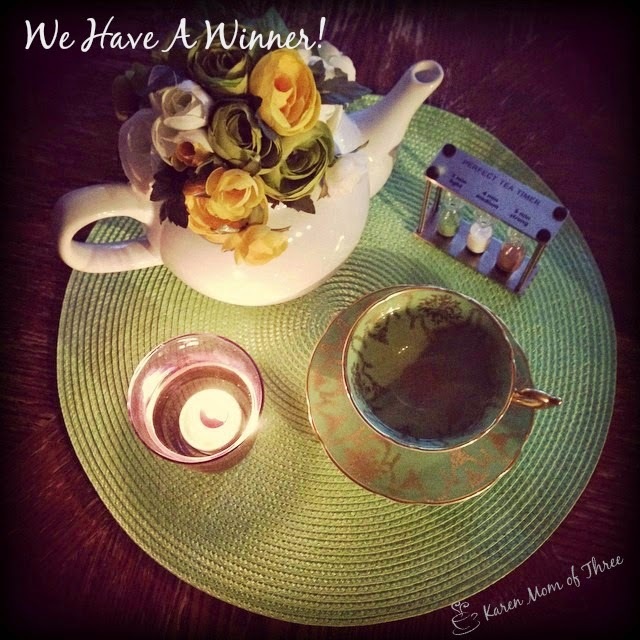 I understand that if you are not local like me the Blue Teapot Website can and does wonderful custom blends and ready to order blends through their on line shop. Click here to visit their website. 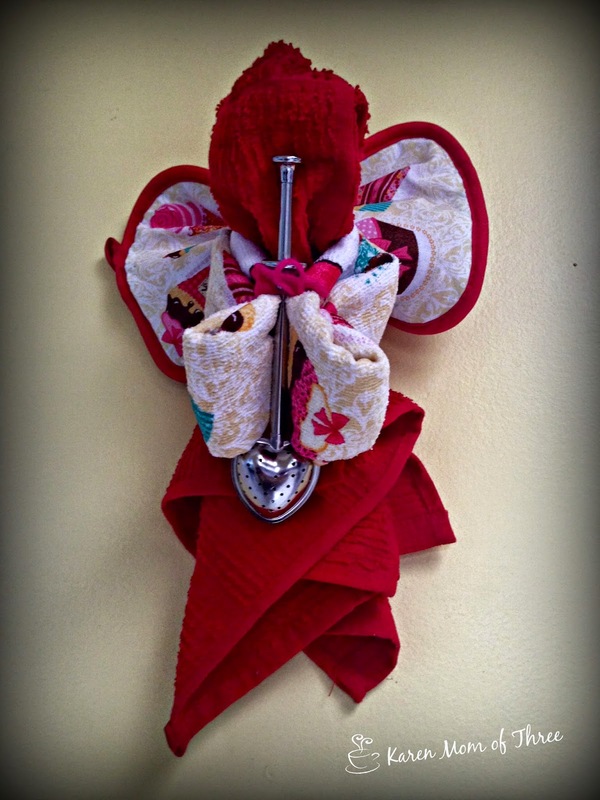 Years ago I made a Kitchen Fairy not unlike the one I made and I am sharing today. 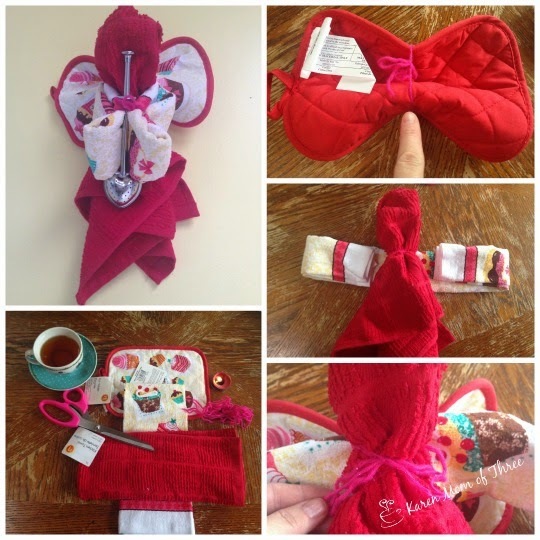 I was in Walmart and found these adorable Cupcake Themed Pot Holders, Oven Mitts and Tea Towels and was reminded of that Mothers Day craft I made all those years ago. Step 1- Remove the tags from you pot holders and tea towels. Use a bit of your yarn and slip it around the middle of your pot holder as I have done in the top right photo. 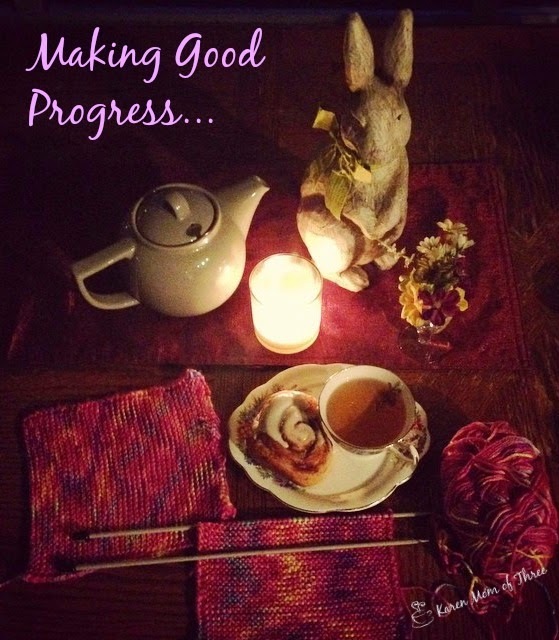 Bring your yarn together and tie a tight bow. This creates your Fairy wings. 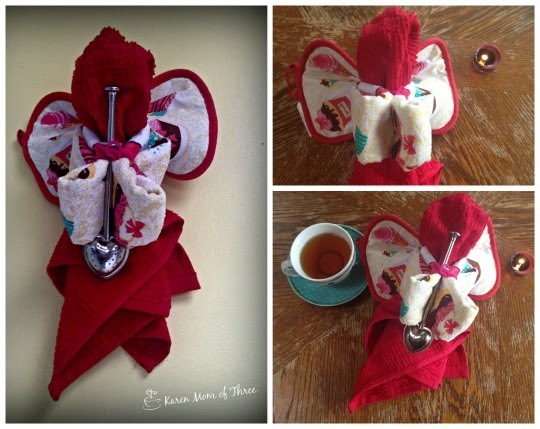 Step 2- Bunch your Main Tea Towel so that you create a head for your fairy and tie a bow with more yarn. Step 3- Fold or roll your other tea towel as shown in the photo above, place your Fairy body on top. 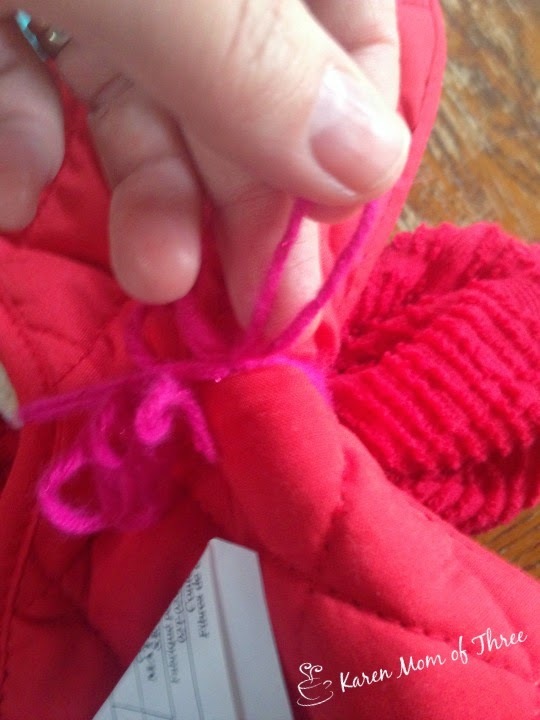 Slide the wings in behind and use more yarn to secure it in place. Step 4- Fold the ends of your fairy arms inwards and use more yarn to hold them together in front of the fairies body. Slide your tea ball or your tea strainer into place and secure with more yarn if needed. Step 5- Attach more yarn so that your fairy can hang in your kitchen add a slip not around the back of the fairy wings. Now your fairy is ready to be displayed in your kitchen or give as a gift. You can always undo and use the pot holder and tea towels and of course the tea ball for tea time. To order your own heart shaped tea strainers here are where I ordered some of mine. I hope you enjoyed this tea time craft! Today is the first week back at school for my boys and I found myself for the first time in two weeks home alone with the cats and the sound of silence. 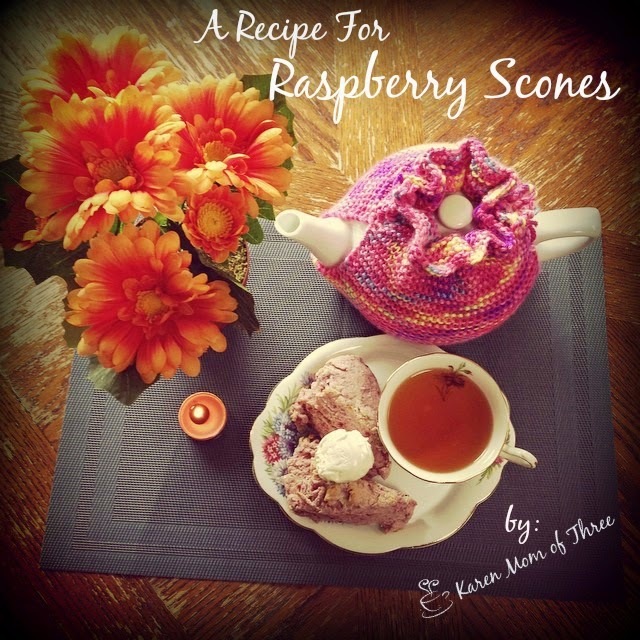 I had a craving for raspberries and remembered I had some in the freezer so I threw together scones for a special back to school treat for myself and thought some of you may like the recipe too. Transfer to a parchment lined cookie sheet. Then press pat down slightly and cut triangle wedges from your scone ball. bake at 400 until the edges are golden brown. Enjoy with your favorite cup of tea in your favorite mug and top with a bit of clotted cream, cool whip ( I am lactose intolerant so I use this) or whipped cream. You could also ice your scones. My First Knit Tea Cozy! I did it! I finally knit my first tea cozy! I only know how to do one stitch (garter stitch) and am a very new to knitting & a lefty knitter who has procrastinated for the last 2 years about knitting a tea cozy! I still can not believe it is done. 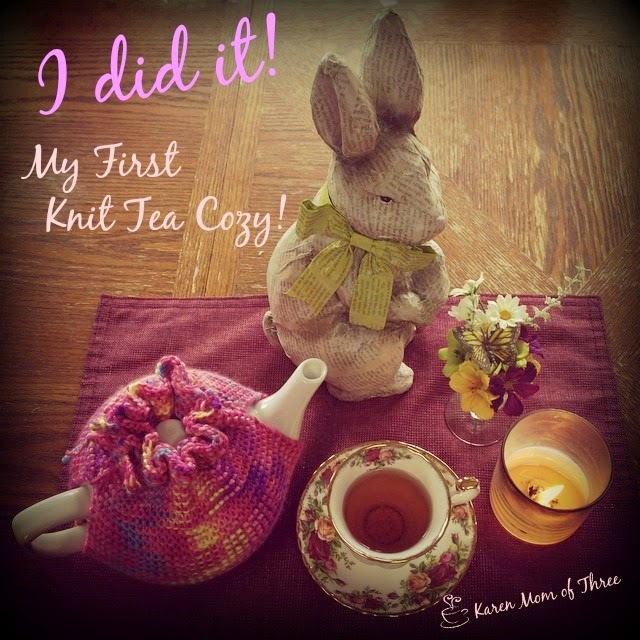 I started knitting my first tea cozy on Wednesday night. 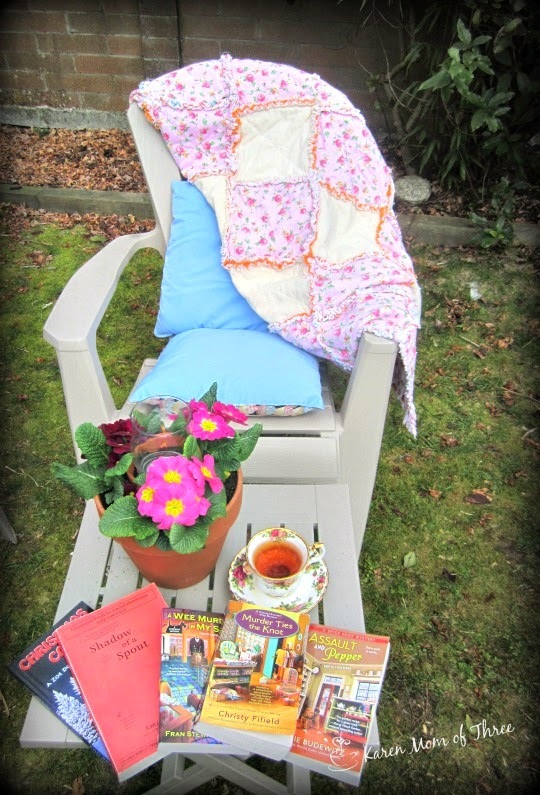 I was waiting on my son to come home from the airport after his spring break trip to see my sister and I had just finished reading & reviewing A Wee Murder in My Shop by Fran Stewart , and was needing something to do with my now idle hands. I searched Google and found All Free Knitting's Free Pattern and tutorial which you can find by clicking here. I was amazed when I read the tutorial and it was a pattern I could read and understand. All I had to do was "Knit two squares and sew them together", I knew I could do that. I finally took the chance. I have had this wonderful Red Heart Gumdrop Yarn for almost a year, my mothers knitting needles that I inherited when she passed away and took a chance on the possibility of crossing something off my New Years Resolution list. Here I am a few days later with a tea cozy I am pretty proud of! The tutorial I used on all free patterns can be found by clicking here. I love Red Heart Gumdrop yarn because even if you only know garter stitch like me you can make your tea cozy look even more amazing with the color pattern it creates. You can find more about Red Heart Yarn by clicking here. 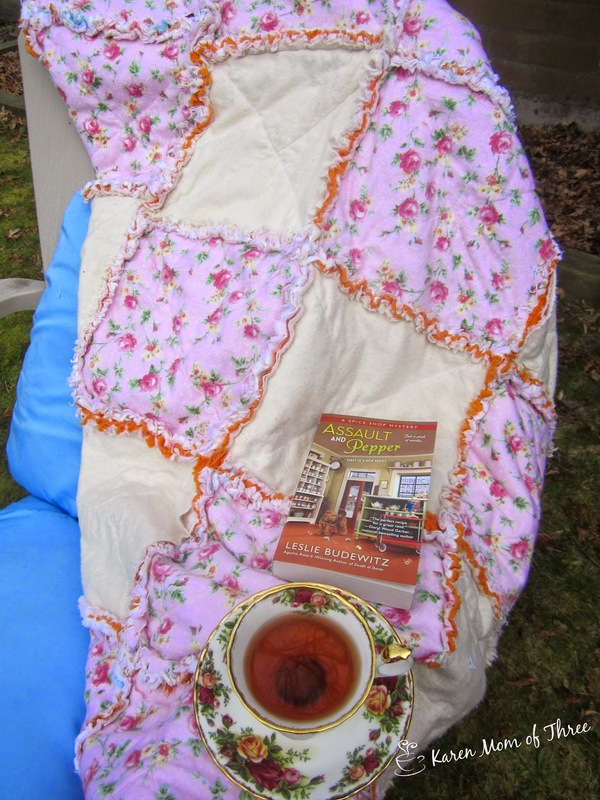 I think I shall go make myself another pot of tea and put that tea cozy to work right away! Let me introduce you to a wonderful new series that I ordered largely due to the cover and well the title got me too. A Wee Murder In My Shop is a first in a new series by Fran Stewart got my attention right away with the adorable Scottie Dog in Plaid. 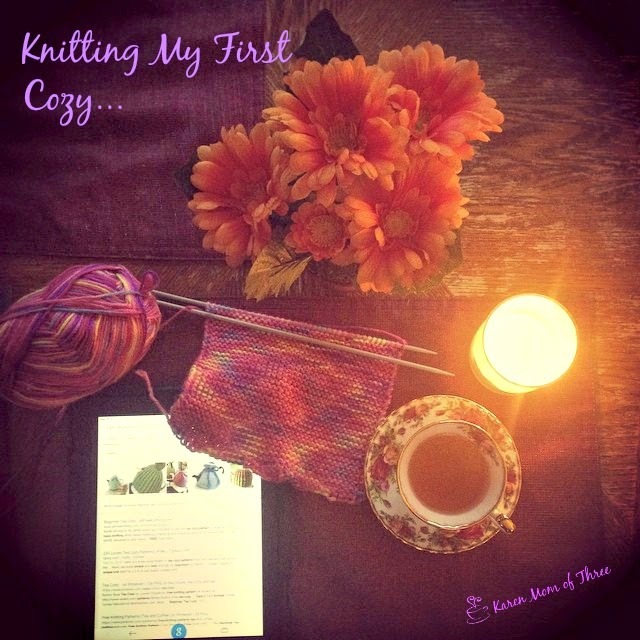 Thanks to the Facebook Page Chatting About Cozies I found this wonderful book. As with most of my books I ordered it from The Book Depository. 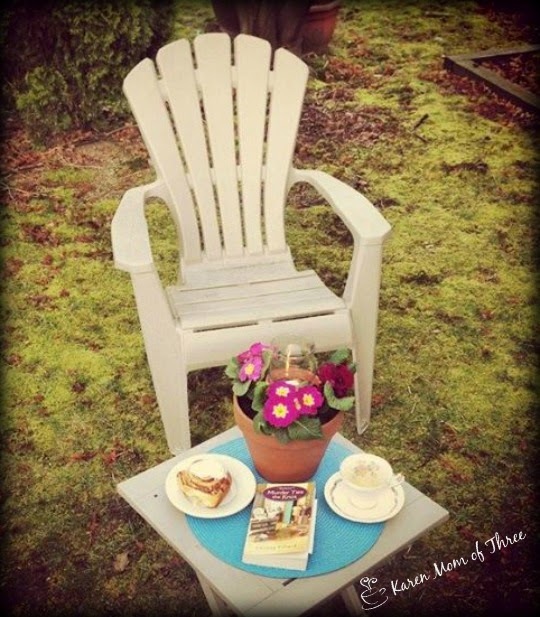 As I knew nothing about the story when I started it I was really surprised to find that this cozy mystery had a healthy dose of the paranormal as well as international travel & mystery! This book was a perfect way to start a new series, I really did not like to put it down and I could not wait to get back to it when I had too. The story takes the reader from a small Vermont town to Scotland and back in 30 chapters all filled with mystery, history, suspense and tartan. I enjoyed the characters in this story, how they related and intermixed. The Scot Shop and the town has strong ties to family, neighbors and Scotland. This read is worth picking up and of course making yourself a "Bracing cup of Tea". 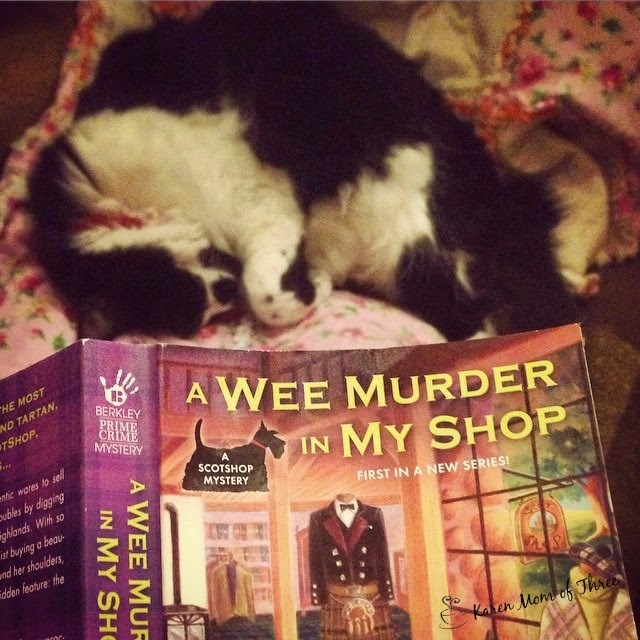 To order your own copy of A Wee Murder In My Shop from The Book Depository please click here. 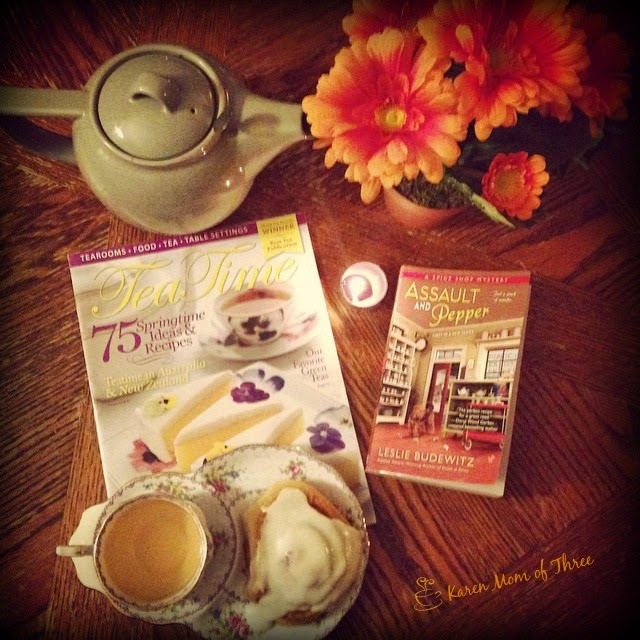 The tea in my pot for this read was Steeped Tea's Bluest Blueberry Loose Leaf Black Tea. This black tea is a favorite of mine especially in the morning. 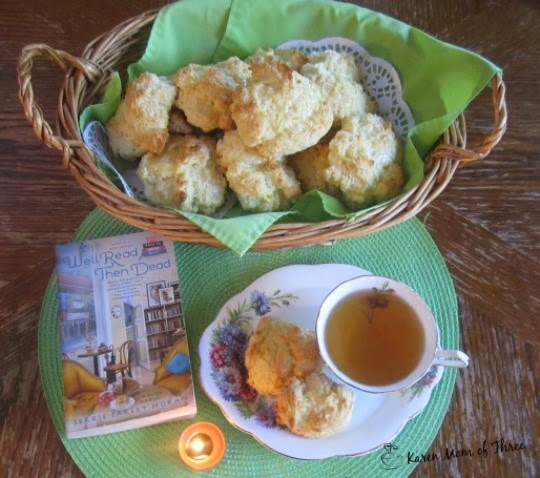 Hot it reminds me of blue berry muffins and as it cools it is a wonderful iced tea. 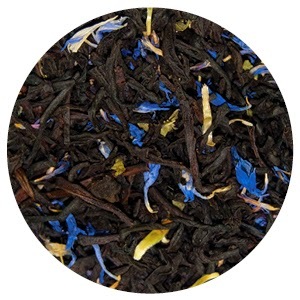 I don't sweeten my teas and this one is sweeter then I normally enjoy but it is a wonderful tea. To find out more about this tea please click here. 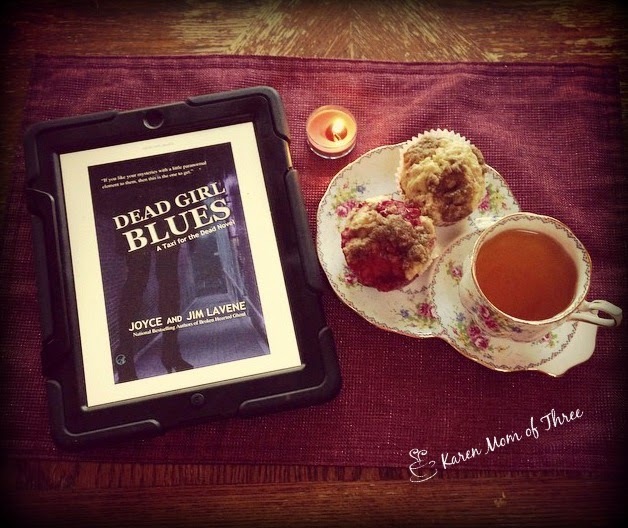 Dead Girl Blues by Joyce and Jim Lavene, I Could Not Put This Down! I was sent an early copy of Joyce and Jim Lavene's Dead Girl Blues from their new Taxi for the Dead series and I could not put it down. I started it after dinner last night and burned the midnight oil to finish it. It was fantastic. Though some would argue that this paranormal mystery is not a true cozy I would have to disagree with them. 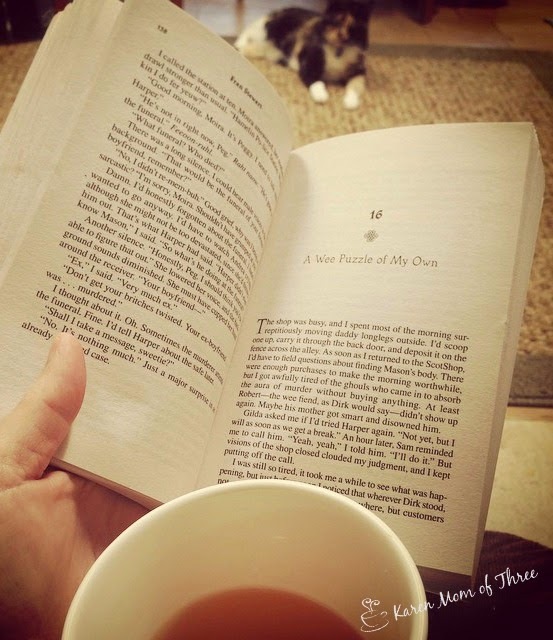 This book has so many cozy elements and qualities that make it as endearing as the many "true cozies" and other paranormal cozy series I currently read. True, likeable and loveable characters along with excellent writing give it the right balance and charm. This is a series you are going to want to read this spring! 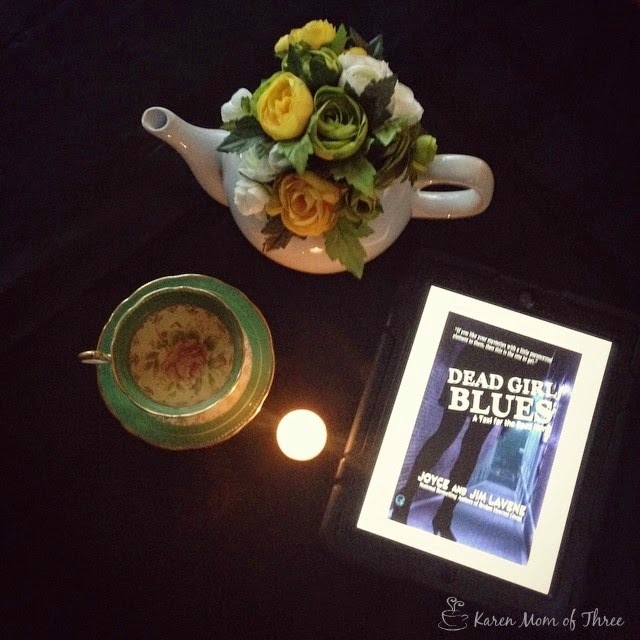 Click here to pre order your Kindle Copy, Dead Girl Blues by Joyce and Jim Lavene comes out April 7th 2015. Read Undead by Morning first in the series and learn more by clicking here. Book 1 Broken Hearted Goul by clicking here. 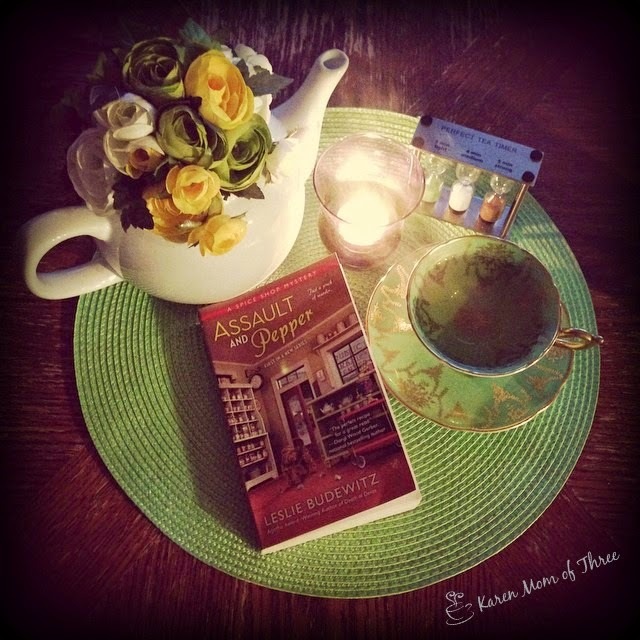 Assault and Pepper First In The New Spice Shop Mystery Series Is Sensational! 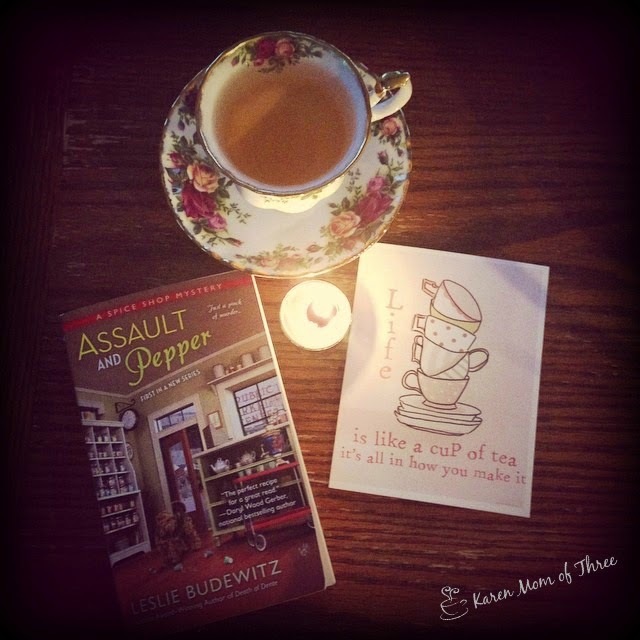 I just finished readin Assault and Pepper tonight. 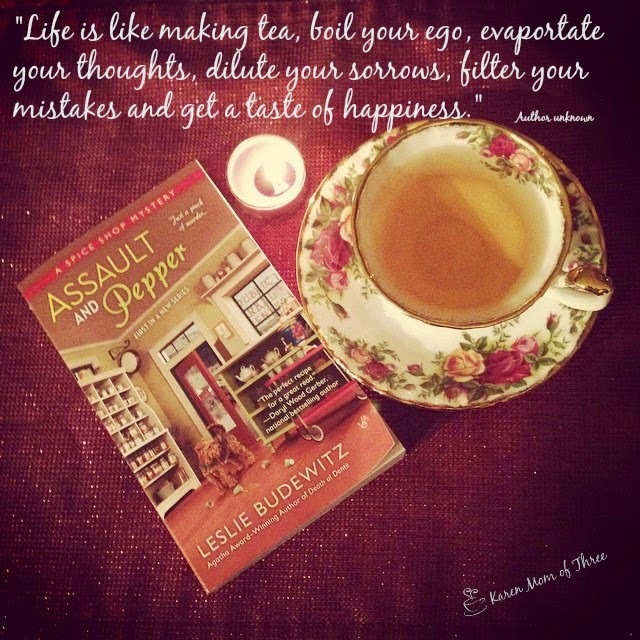 A first in a new series by Leslie Budewitz. A Spice Shop Mystery set in Seattle's Famous Public Market. This is a wonderfully descriptive and captivating story. I was drawn to this book by it's cover, having first seen it on a Facebook Page I follow called Chatting About Cozies I pre ordered the book like I do so many based on the cover, can you blame me? 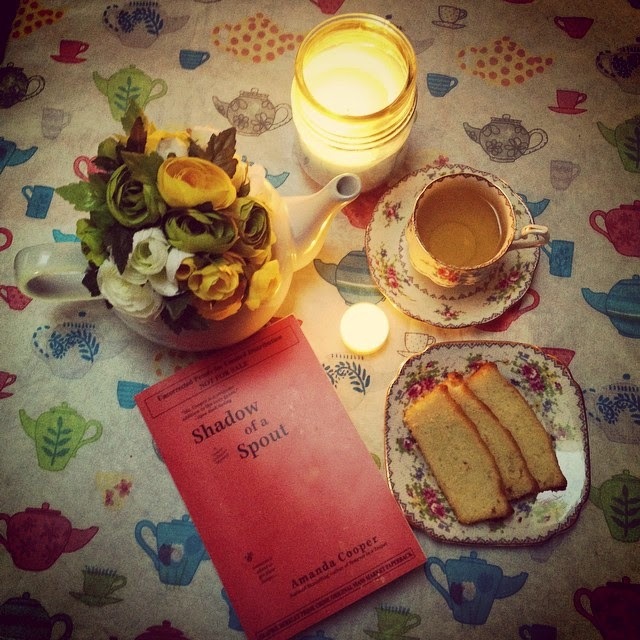 Look at that lovely shop set up and the tea pots! As pretty as the cover is the story and the descriptions which accurately describe Seattle and the tantalizing spices and foods discussed make this a foodies dream series! The book has a very believable setting, rich and diverse characters and a very good mystery. A great recipe for what I hope will be a long running series. Living as close to Seattle as I do this shop was a fun read for me after years of reading East Coast and Southern based cozies it was nice to find a little a little of that cozy feeling so close to home. I should also mention that the bonus recipes in the back of the book are also fantastic! I look forward to another Spice Shop Mystery and hope we don't have to wait too soon! We have a winner! Terri Crossley is the winner of the T-shirt and Book Give away! Her entry was selected at random from the number of entries received and she has been notified by email. 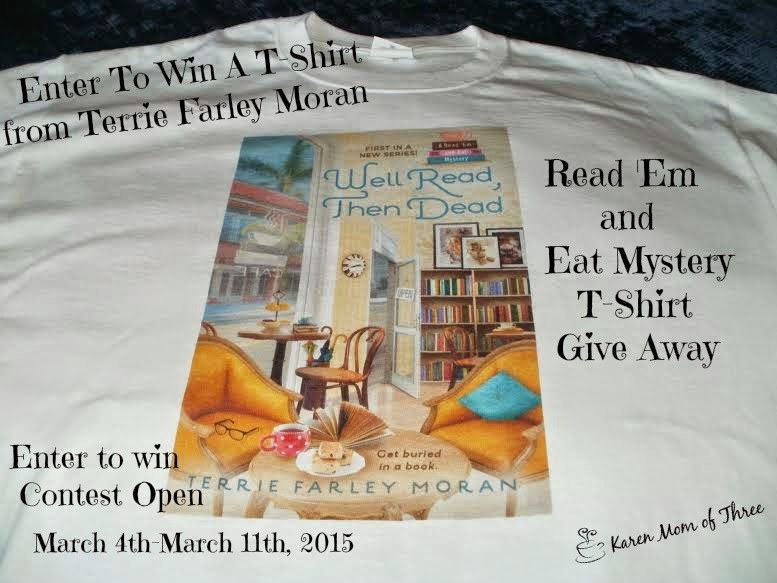 Terri receives the first installment in the read em' and eat series and a t-shirt to match! Thank you to all who entered! I am so excited for the release of Caught Read Handed and will bring you more info about it as we get closer! Thank you To Terrie Farley Moran for sponsoring this give away! To order your own copy of Caught Read Handed please click here. I am a crafty person but I am the type of crafter I call an "impatient crafter" That means if it takes longer then an hour start to finish I am not likely to try it. However I have wanted to make a quilt for a long time and friends encouraged me to try to make a rag quilt. 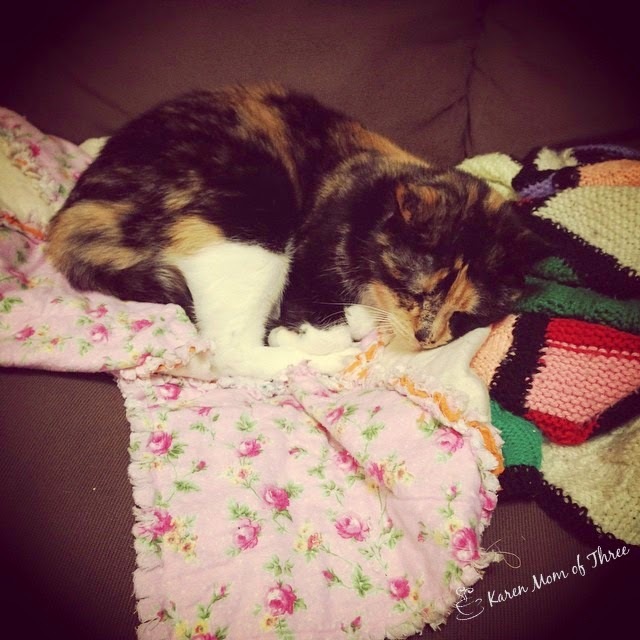 A rag quilt is a very easy quilt to make and normal sewers can get it done in one night, me it took a few weeks. But there is something very therapeutic in ripping up flannel! 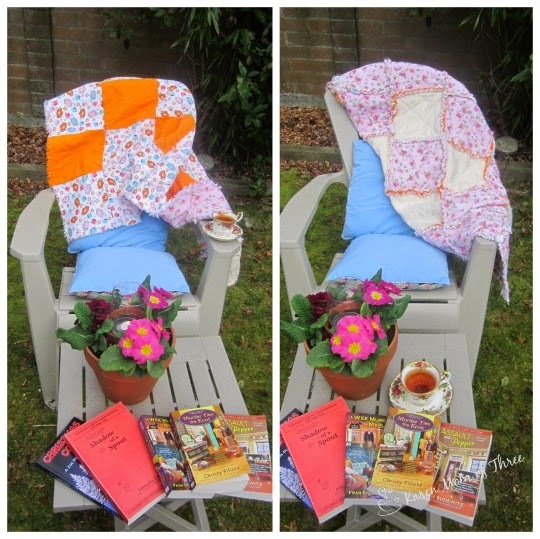 One side of the quilt is Rose Buds & Cream Flannel and the other is a very fun Tea Pot print flannel that I paired with bright orange flannel. I watched this tutorial to figure out how to make my quilt and this was very easy to follow. I really liked this tutorial and I will make another but will buy some Ragging Shears first! Thank you to my friends Cheryl and Greta for their support in making this quilt! I discovered the Haunted Souvenir Shop Mystery series at my Library about two years ago. 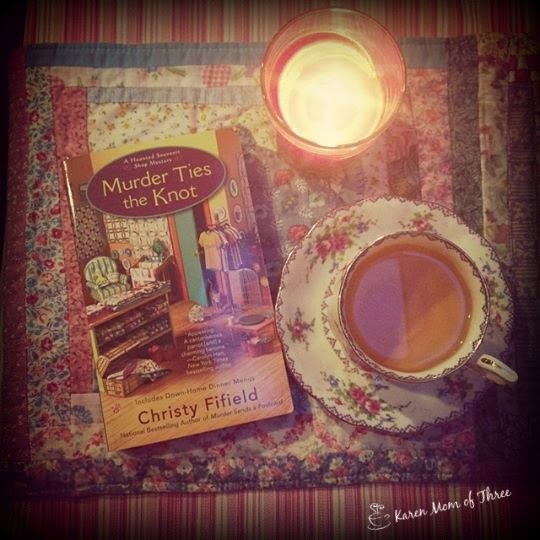 Spinning the rack for inspiration I happened upon the first in series called Murder Buys A T-Shirt by Christy Fifield. I took a chance on it and I am so glad I did as this is a fantastic series. Proving that "Libraries do sell books" (thank you to Lisa K for that comment!) I no sooner closed the book on Murder Buys a T-shirt then I ran to order the next in series and that has continued right up to Murder Ties The Knot. I can not say enough about this series. It has deep and wonderful characters, great recipes and the cozy mystery pet is a Parrot, seriously amazing, foul mouthed and yet a wonderful addition to the stories! 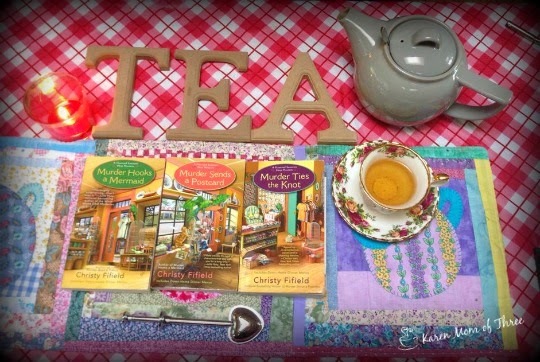 If you are looking for a great cozy series that is already 4 books in pick up Christy Fifiled's Haunted Mystery Series. You will be thrilled you did. 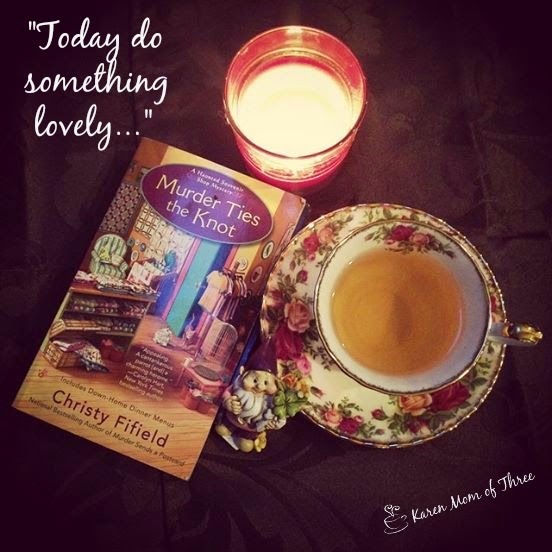 Book Four Murder Ties the Knot is sensational! Click here to order with free shipping from The Book Depository! 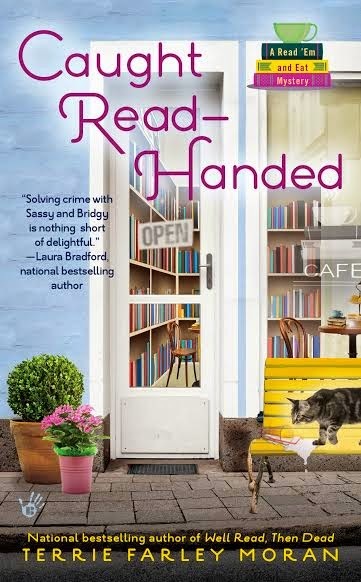 Today I am thrilled to be one of the first bloggers to share with you the revised cozy cover of Caught Read-Handed by Terrie Farley Moran The above image is the New and Improved Cozy cover for the much anticipated second Read Em' and Eat Mystery due out in just 125 more days! I am so very excited to share this cover release with you and Terrie has also provided a fun T-shirt give away to get us geared up for the release of Caught Read- Handed. To enter the contest to win this t-shirt email me here at karenmowen@gmail.com with READ in the subject line for your chance to win! Contest is open March 4th to March 11th 2015 Contest Open to our North American Readers and void where not allowed. *Winner will be chosen at random from entries received. 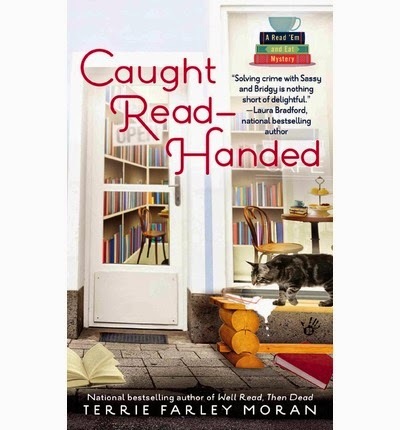 Thank you Terrie for this fun give away and for getting us so excited for the release of Caught Read Handed I am so excited for the release and I hope you will join me in ordering this wonderful book. I know there are some wonderful surprises in store for us in the Read 'Em And Eat Series, I can not wait to share more of them with you soon! 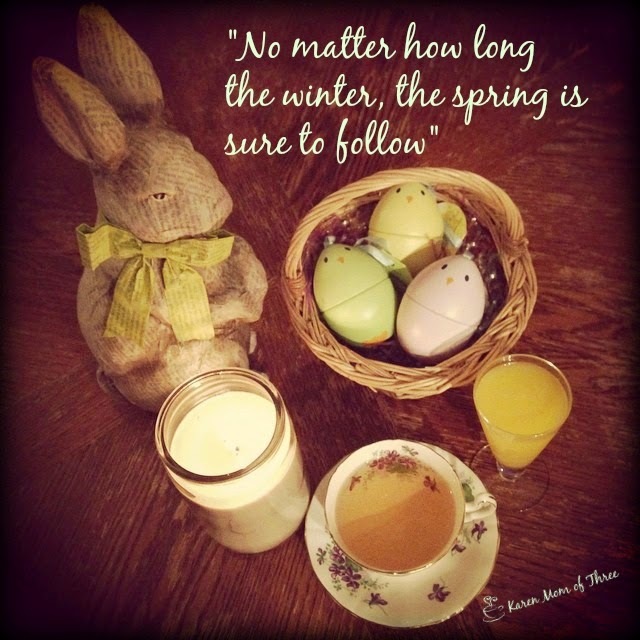 36 Days and Counting Until The Release of Amanda Cooper's Shadow Of A Spout! 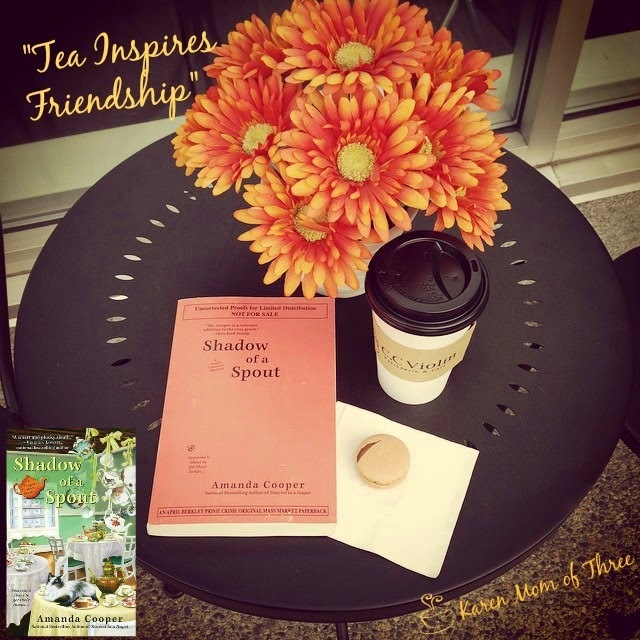 Today I am thrilled to share my review of Shadow of a Spout by Amanda Cooper with all of you. First I would like to thank Amanda for sending me the Advanced Reading Copy and for allowing me to contribute to the back of the book. For more on what I contributed you will have to wait for the books release to see! The above photo is my celebratory Tea and Macaron from one of my favorite places to stop for tea called C.C. Violin here in West Vancouver BC. It was a lovely coincidence when the flowers matched the Advanced Reading Copy Cover! I also included in the photo what the cover of Shadow of a Spout will look like. 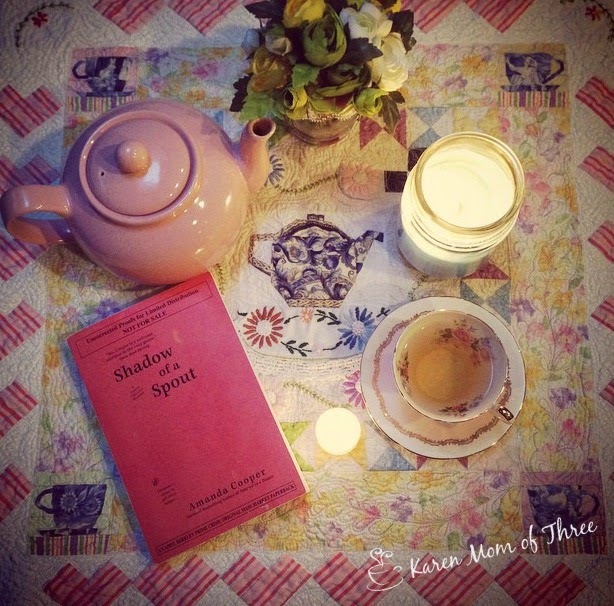 I took the weekend to read through Shadow of a Spout and I loved it. 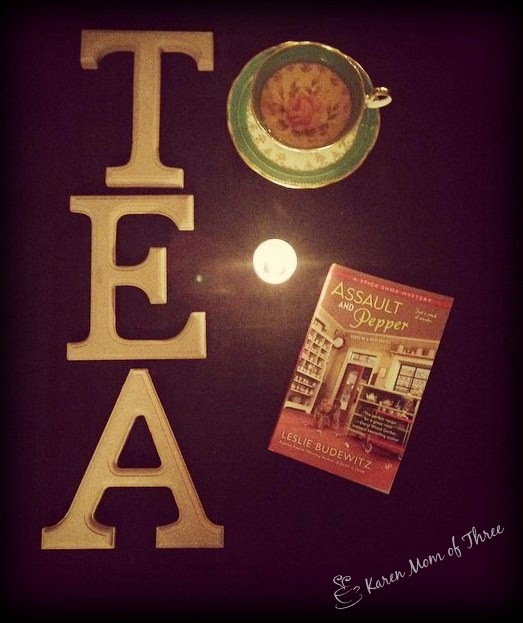 It is a tea drinkers delight to find a series that fits so perfectly with your own interests and loves! The story takes place away from the small town of "GiGi" at a teapot collectors convention. The perfect weekend get-a-way in my opinion and something I long to do. I was so easily caught up in this story and thoroughly enjoyed it! 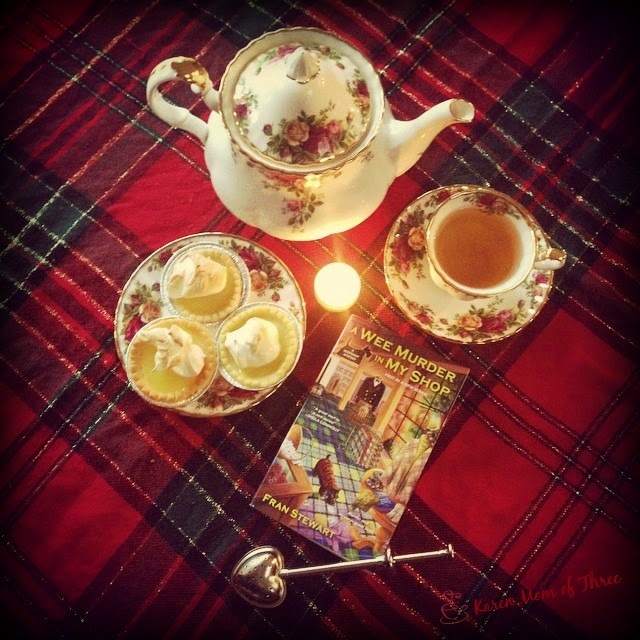 I was guessing right up until the end in this well written installment of the Tea Pot Collector Mystery and am so excited to find out what happens next! I can not wait until my order from The Book Depository Arrives in 36 days! The cover and series is fast becoming a favorite and I love how Amanda Cooper writes this book from so many character points of view! To order your own copy like I did from The Book Depository ( Which I Do because I love free shipping, the ability to pay with Pay Pal and getting my mail by Royal Mail) Please Click here. Mix flour, baking soda, baking powder and salt in a bowl. Use a mixer to blend together the eggs, sugar, butter, vanilla,and lemon juice. Pour wet ingredients into the dry ingredients and blend until smooth..
Pour batter into a well greased 9x5-inch loaf pan. Bake at 350 degrees for 45 minutes or until a toothpick stuck into center of the cake comes out clean. Let sit 5 minutes before removing from the pan and slice and serve.